Indium oxide doped with tin oxide, ITO, is used to make transparent conductive coatings. Thin film layers can be deposited by electron-beam evaporation or sputtering. Roll or web coating on polymer substrates is done by magnetron or other techniques of sputtering. Typical applications of ITO-coated substrates include touch panel contacts, electrodes for LCD and electrochromic displays, energy conserving architectural windows, defogging aircraft and automobile windows, heat-reflecting coatings to increase light bulb efficiency, gas sensors, antistatic window coatings, wear resistant layers on glass, etc. The optical and electronic properties of ITO films are highly dependent on the deposition parameters and the starting composition of evaporation material used. The deposited film layer must contain a high density of charge carriers for it to conduct. These carriers are free electron and oxygen vacancies, and an excessive population produces absorption. High conductivity (or low sheet resistance) is balanced against high transmission in the visible region. Sheet resistance can be less than 10 Ohms/sq. with a visible transmission of >80%. To obtain transmission near 90%, sheet resistance must be >100 Ohms/sq. 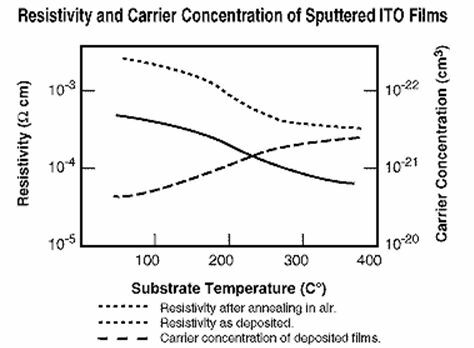 ITO films behave as metals to long wavelength light because of the presence of a plasma wavelength above 1 µm. At longer wavelengths, the film becomes reflecting, and the IR reflectance is related to the sheet resistance of the film; sheet resistance must be <30 ohms/sq.="" to="" obtain="" ir="" reflectance="">80%. The refractive index for a film that is transparent in the visible region remains near 1.95 and is not strongly dependent on the deposition parameters. Index is generally of secondary concern for conducting applications. The extinction coefficient will vary with conductance. The deposition parameters play interdependent roles in the optimization of film properties. Principal among the deposition parameters are partial pressure of oxygen, substrate temperature, rate of deposition and material composition. Some processes require post deposition baking at 300-500° C in air to oxidize residual fractionated metal component and improve conductivity. For sputter processes, a high energy plasma can be substituted for a high substrate temperature. Best results are obtained using reactive evaporation at a slow rate and relatively high pressure because the starting material is reduced (loses oxygen) during evaporation. Recommended preconditioning consists of slowly sweeping a low power electron beam to gradually and uniformly fuse the surfaces of the material and avoid hole drilling by the beam. Monitor the pressure and crucible to minimize outgassing and spitting while slowly increasing the power to just below evaporation temperature. Film thicknesses should be in the range 1000-2000 Å for high IR reflectivity, but there is little dependence of conductivity on thickness. The specific geometry of the evaporation system can influence the results, so the parameters listed should be considered guidelines. Post baking in air might be required to adjust the transmission or to obtain minimum sheet resistance. Materion's high density, high-oxide content targets afford good control of film stoichiometry and eliminate the need for post-baking in many cases. DC or reactive RF magnetron techniques are often used for evaporation. Ionized argon is the sputtering gas with a small percentage of oxygen mixed in. The oxidized composition of the Materion targets requires less oxygen partial pressure than other targets. Sputter deposition parameters include gas composition, flow rate, power density, bias voltage, geometry, plasma current and substrate temperature. Reactive sputtering from high density oxide targets is the most successful method because greater control of film stoichiometry is possible. It is generally necessary to include oxygen to prevent reduction of the evaporant. Example concentrations are 1-3 x 10-5 Torr oxygen and 1 x 10-2 Torr argon. Sputtering onto polymer substrates such as PET requires attention to the following parameters. The substrate surface must be free of water and other surface contaminants. Low substrate temperatures for coating polymers are possible with magnetron sputtering. High deposition rates are achieved in roll or web coating systems. Pre-sputtering of the target surface to remove adsorbed gases and partially reacted layers is essential for success. The addition of a small percentage of hydrogen has been found beneficial in achieving low sheet resistances at low substrate temperature. The chart below gives the dependencies of carrier concentration and resistivity on substrate temperature for a RF sputtered Materion target. The carrier concentration increased substantially probably due to the creation of more oxygen vacancies at the hotter temperatures. Typically, resistance is traded with transmission, and these are directly related to the degree of oxidation of the film. The high oxide composition of Materion’s high density target and bulk ITO forms make them ideal for low temperature applications, such as polymer substrates for LCD, touch panels, and other high volume production needs. Materion offers other particle sizes for evaporation as well as sputtering targets of various compositions. To view pricing on the items listed above, please visit the Materion on-line catalog to search via the item number or chemical name. If you require a custom manufactured item, please submit your specific requirements via our Request for Information Form or by phone at 414-289-9800 . You can also contact Materion for other inquires regarding our products and services by filling out our Contact Us Form. Ray Swati, R. Banerjee, N. Basu, A. K. Batabyal, and A. K. Barua, J. Appl. Phys. 54(6), 3497 (1983).